Watching the trailer for Homefront, you’d get the impression that the film is just another one that uses a barebones story as an excuse to shuttle in the wholesale action, one where there is never an intelligent resolution to problems for the sake of manufacturing as much killing and maiming as possible—and you’d be mostly correct. With the big takedown of a druglord, DEA Agent “Phil Broker” (Jason Statham) decides to retire. After the troubling death of his wife and mother of daughter “Maddy” (Izabele Vidovic), Broker moves them out to a remote country town to start again. 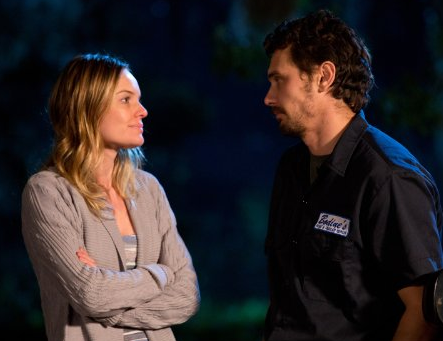 When a schoolyard fight between Maddy and a son of the Bodine family starts a dispute between “Cassie” (Kate Bosworth), a feud erupts, resulting in the eventual outing of Broker’s past. 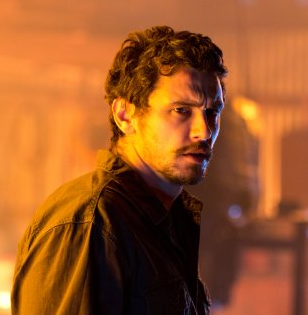 With he and his daughter’s lives in mortal danger from the town meth-dealing psycho and brother to Cassie “Morgan ‘Gator’ Bodine” (James Franco), Broker will have to flee or else fight to stay alive. With the screenplay having been written by Sylvester Stallone, it is hard to be surprised at what takes place on screen. What just might qualify as a surprise is how Statham has lately been showing up in movies that involve actual storylines with legit plots such as this one. Yes, that’s right. There is a story here, although the trouble to be gone through to get through it lessens its value considerably. At some places, the acting may be less intelligent than the people the actors are supposed to play, with the inevitable conflicts at schools, restaurants, and gas stations seeming like the kind of stuff we had in the 1980s that always had to end in a fight. The dialog leaves much to be desired, and so do any relationships that involve emotional fine-tuning, like a father and daughter trying to move on together after a loss or two friends just working and talking. When it becomes this noticeable how humans that are supposed to connect aren’t connecting, there’s a problem. But Homefront offers us enough of a plot to work with, which at times threatens to make it enjoyable. I have never been a fan of Franco who here plays a supremely over-the-top character that still manages to stand out like a sore thumb, even in the purposely dirty, remote, and semi-civilized redneck settings provided. But there is more to his character than we care to give credit for. In the case of Bodine, he is not just a criminal, but a strung-out, skill-lacking criminal with a tendency for sociopathic behavior who struggles to have his part in a world of crime. Homefront makes just enough of an impression because certain of its characters have limits that are truly their limits. There is no reliance on typical action clichés to move things forward, no Transporter-level stunts involving gross improbabilities, or fantastic “boss enemy” face-offs that many will go in expecting to see. And alas, there is some personal growth involved in the relationship between the Brokers and the Bodines. It’s a good thing when we get the impression that those getting whipped in a fight might actually learn from the experience and not want to fight anymore. If only 80s movies had known that. Bosworth’s Cassie is the most spot-on performance of them all. She talks, looks, and feels like a drug-popping, sorry excuse for a mother married to a man not any better (Marcus Hester), and in surroundings she deep-down wants to change, which is how she never ceases to outscore everyone else in every single scene she appears in (it is solely because of her that this film doesn’t fall below its C+ grade)—unlike Ryder who gives a respectable but somehow still not centered performance as the object of Bodine’s affections. The rising star here, however, looks to be Vidovic, a brand-new face we may end up seeing more of very soon. How many child actresses do you remember, much less think about, when watching your movies? There isn’t all that much to like here. The fight scenes are too sharply edited from fast-shifting camera angles that don’t do them justice and there may be as much stiltedly delivered profanity than regular dialog thrown in for nothing more than the “tough” effect. While we never lose interest in the turnout, what we are given is a finished product with lots of rough-draft material atop a story that could have really touched us.